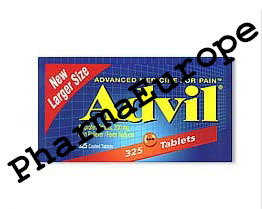 Advil tablets: for the temporary relief of minor aches and pains due to the common cold, headache, toothache, muscular aches, backache, minor pain of arthritis, for the pain of menstrual cramps and temporarily reduces fever. Adults: Take 1 tablet every 4 to 6 hours while symptoms occur. If pain or fever does not respond to 1 tablet, 2 tablets may be used but do not exceed 6 tablets in 24 hours, unless directed by a doctor. Children: Do not give this product to children under 12 except under the advice and supervision of a doctor. Each tablet contains Ibuprofen 200 mg.
Do not take for pain for more than 10 days or for fever for more than 3 days unless directed by a doctor. If pain or fever persists or gets worse, if new symptoms occur, or if the painful area is red or swollen, consult a doctor. These could be signs of serious illness. If you are under a doctor's care for any serious condition, consult a doctor before taking this product. As with aspirin and acetaminophen, if you have any condition which requires you to take prescription drugs or if you have had any problems or serious side effects from taking any non-prescription pain reliever, do not take this product without first discussing it with your doctor. If you experience any symptoms which are unusual or seem unrelated to the condition for which you took ibuprofen, consult a doctor before taking any more of it. Although ibuprofen is indicated for the same conditions as aspirin and acetaminophen, it should not be taken with them except under a doctor's direction. Do not combine this product with any other ibuprofen-containing product. As with any drug, if you are pregnant or nursing a baby, seek the advice of a health professional before using this product. It is especially important not to use ibuprofen during the last 3 months of pregnancy unless specifically directed to do so by a doctor because it may cause problems in the unborn child or complications during delivery. Keep this and all drugs out of the reach of children. Do not take this product if you have had a severe allergic reaction to aspirin, e.g.-- asthma, swelling, shock or hives, because even though this product contains no aspirin or salicylates, cross-reactions may occur in patients allergic to aspirin. Store at room temperature; avoid excessive heat (40C, 104F). This medicine contains the active ingredient ibuprofen, which belongs to a group of medicines called non-steroidal anti-inflammatory drugs (NSAIDs). It works by blocking the action of a substance in the body called cyclo-oxygenase. Cyclo-oxygenase is involved in the production of various chemicals in the body, some of which are known as prostaglandins. Prostaglandins are produced in response to injury or certain diseases and would otherwise go on to cause pain, swelling and inflammation. Ibuprofen is therefore used to relieve pain and inflammation. All the medicines in this group (NSAIDs) reduce inflammation caused by the body's own immune system, and are effective pain killers. Ibuprofen can be used to relieve pain such as muscular aches and pains, period pains, headache, backache, rheumatic pain, dental pain and neuralgia. It can also reduce feverishness and the symptoms of colds and flu. What is it used for? Take 1 tablet every 4 to 6 hours while symptoms persist. If pain or fever does not respond to 1 tablet, 2 tablets may be used but do not exceed 6 tablets in 24 hours, unless directed by a doctor. The smallest effective dose should be used. Take with food or milk if occasional and mild heartburn, upset stomach, or stomach pains occur with use. Consult a doctor if these symptoms are more than mild or if they persist. Children: Do not give this product to children under 12 except under the advice and supervision of a doctor. Do not take for pain for more than 10 days or for fever for more than 3 days unless directed by a doctor. If pain or fever persists or gets worse, if new symptoms occur, or if the painful area is red or swollen, consult a doctor. These could be signs of serious illness. If you are under a doctor's care for any serious condition, consult a doctor before taking this product. As with aspirin and Acetaminophen, if you have any condition which requires you to take prescription drugs or if you have any had any problems or serious side effects from taking any non-prescription pain reliever, do not take Ibuprofen Tablets without first discussing it with your doctor. If you experience any symptoms which are unusual or seem unrelated to the condition for which you took Ibuprofen, consult a doctor before taking any more of it. Although Ibuprofen is indicated for the same conditions as aspirin and Acetaminophen, it should not bet taken with them except under a doctor's direction. Do not combine this product with any other Ibuprofen containing product. As with any drug, if you are pregnant or nursing a baby, seek the advice of a health professional before using this product. It is especially important not to use Ibuprofen during the last 3 months of pregnancy unless specifically directed by a doctor because it may cause problems in the unborn child or complications during delivery. Keep this and all drugs out of the reach of children. In case of an accidental overdose, seek professional assistance or contact a poison control center immediately. Aspirin sensitive patients: Do not take this product if you have had a severe allergic reaction to aspirin, e.g. asthma, swelling, shock or hives, because even though this product contains no aspirin or salicylates, cross-reactions may occur in patients allergic to aspirin. If you consume 3 or more alcoholic drinks every day, ask your doctor whether you should take ibuprofen or other pain relievers/fever reducers. Ibuprofen may cause stomach bleeding.